Click here for interview. Janine & Steve’s segment starts at 5:32 minutes into the session. 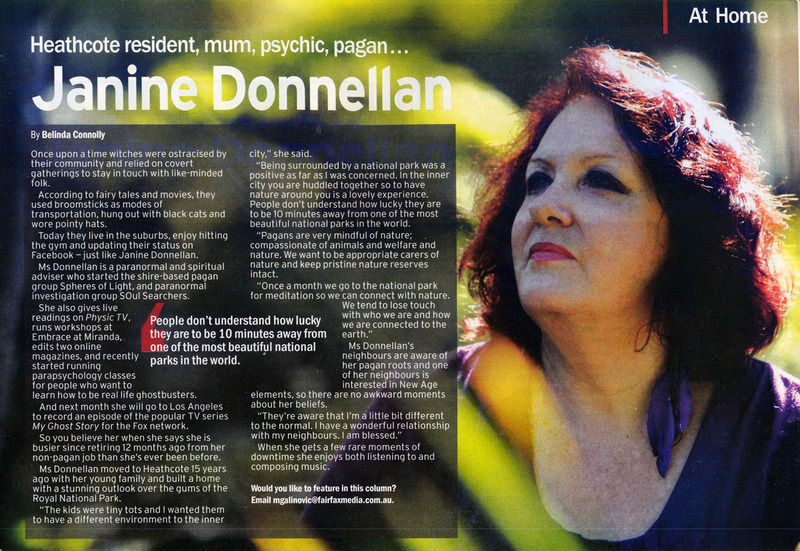 Janine was interviewed at the Australian Paranormal & Spiritual Expo and SOuLSPI presented a workshop on Parapsychology at this event. The Expo is a day full of learning, fun and networking, dedicated to the paranormal and spiritual realm. Stalls are available with hard to buy items, psychics to give you guidance or a glimpse of your future, and workshops to educate you on any aspect of the paranormal / spiritual that you may wish to learn. 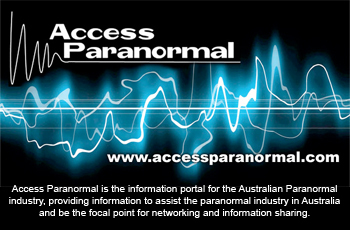 See the website at www.australianparanormalandspiritualexpo.com.au. Janine’s interview starts at 2:15 on the video. 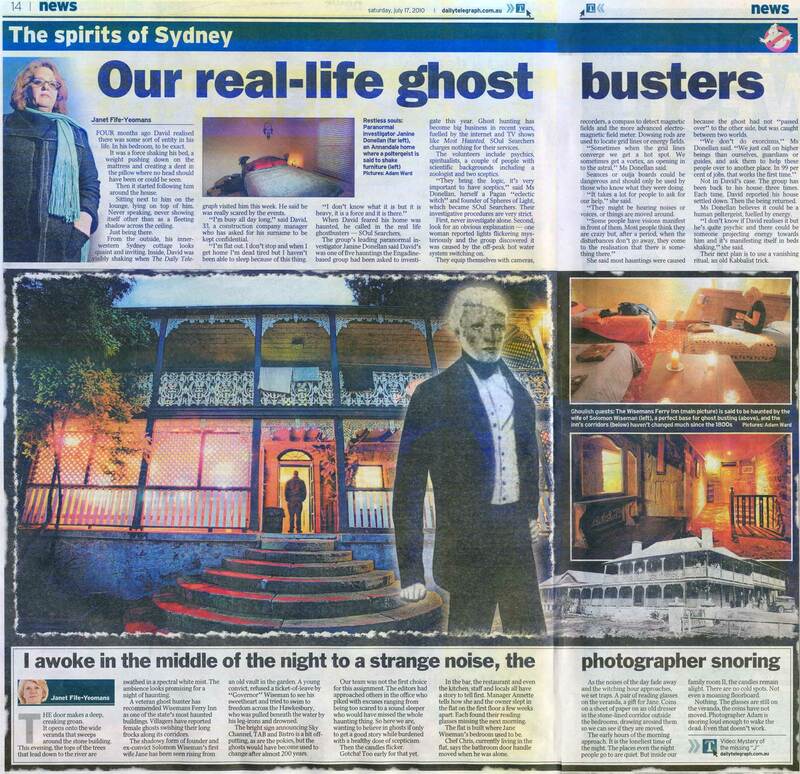 Janine Donnellan from SOuLSPI was asked by the Daily Telegraph to investigate the paranormal activity at St Thomas Rest Park. 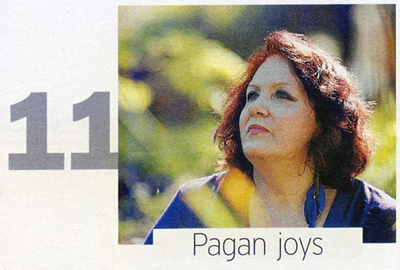 Here is the article from May 11th, 2013 edition of the “Daily Telegraph” newspaper. Read it on the newspaper website here. This episode, aired 22nd April, investigated the practice of home investigations on the behalf of a client and the possible haunting of antiques. “Eye on Antiques” features an interview with Janine and Steve from SOuL Searchers Paranormal Investigations. Janine and Steve’s interview starts at 38:50 on the podcast player below (about half way along the player). You can also listen here. 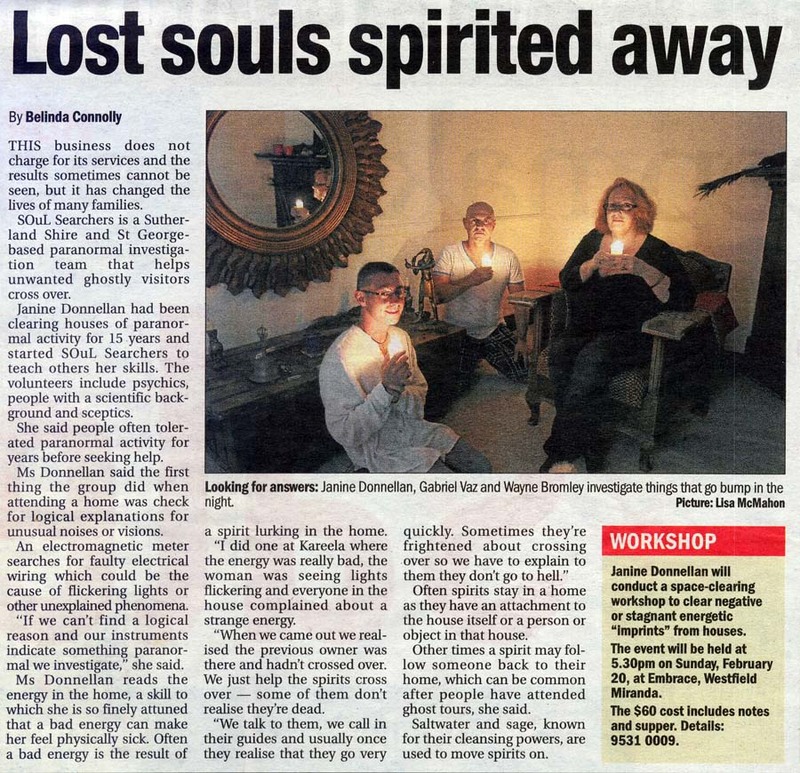 Three members of the SOuLSPI team were filmed for an episode of the hit US show My Ghost Story. 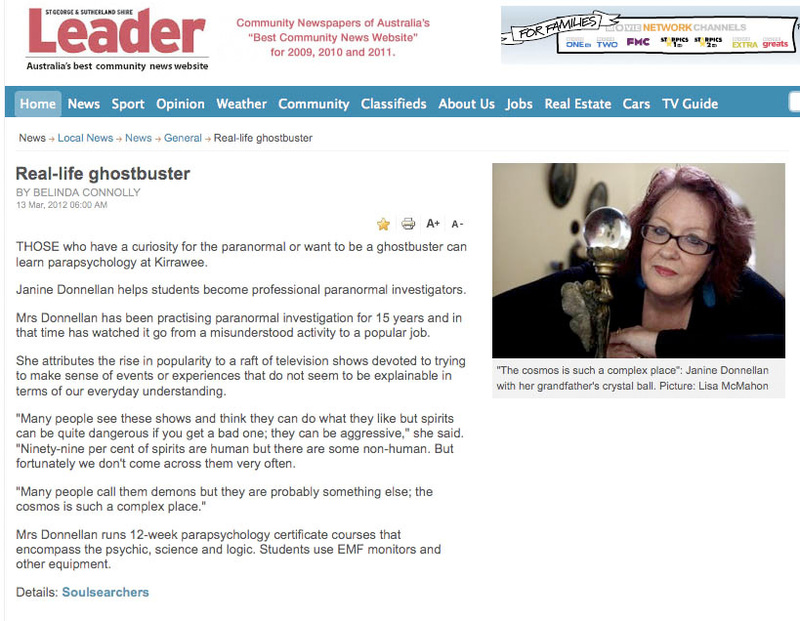 Our segment of My Ghost Story: Caught on Camera – 57 (Season 5 Episode 2) called “Haunting Down Under” which aired in the US on 9/3/2013, is shown below. 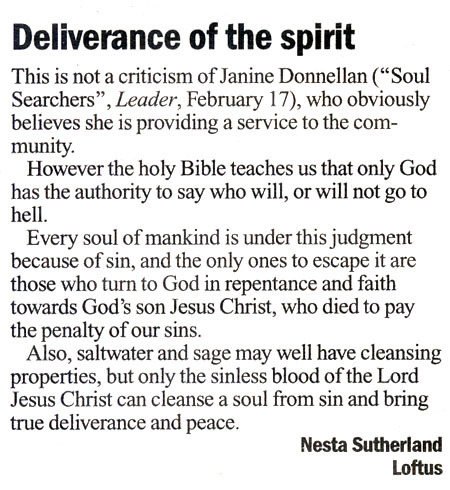 An interview by Belinda Connolly for the April 9th, 2013 edition of the “St George & Sutherland Shire Leader” newspaper, page 17. 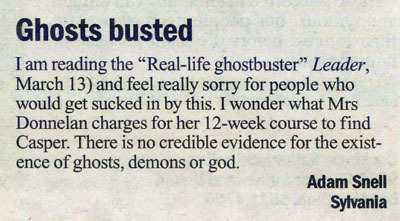 Click on the image below or read it in the newspaper here. 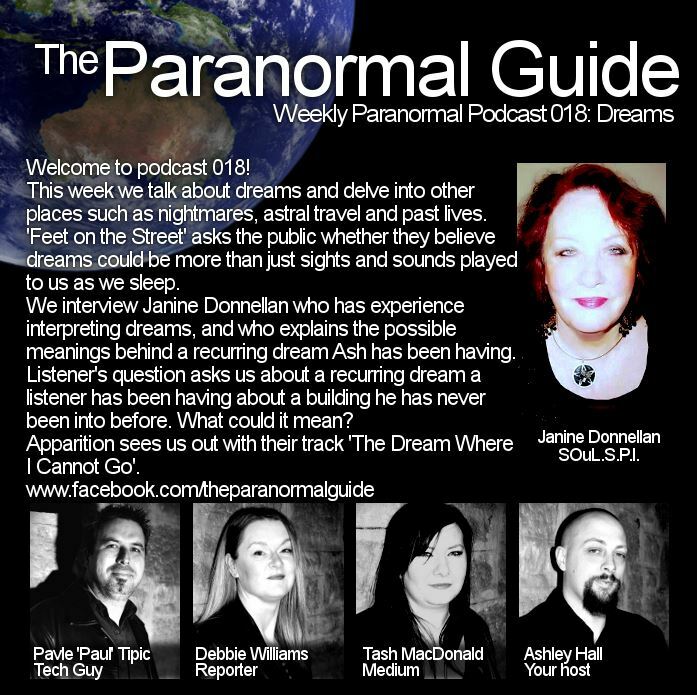 Janine was interviewed by Ashley Hall of Paranormal Guide, about dreams. Janine’s interview starts just after halfway at 35:07 minutes on the podcast player below. You can also listen here and here. 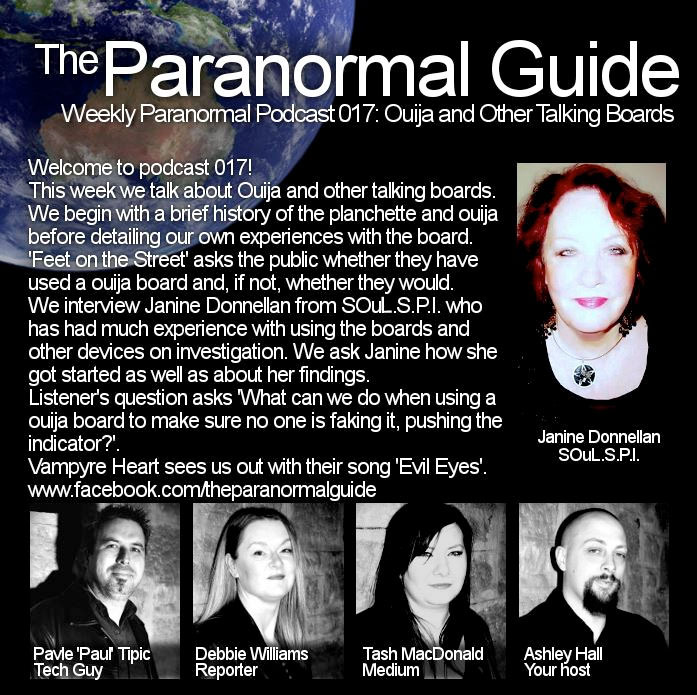 Janine was interviewed by Ashley Hall of Paranormal Guide, about ouija boards. Janine’s interview starts just after halfway at 34:03 minutes on the podcast player below. You can also listen here and here. 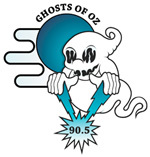 On June 25, 2012 Janine was interviewed by Ghosts of Oz Radio (on Alive 90.5 FM which is a community radio station for Parramatta, Holroyd and The Hills) about the SOuL Searchers investigation at Monte Cristo Homestead. By Belinda Connolly: from Engadine Menai Magazine delivered with St George & Sutherland Shire Leader newspaper, 17 May 2012, page 11. 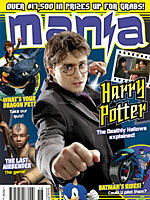 The image at the left appeared on the “Contents” page of the magazine and shows the title of the article. Click on the image below to read the story. Janine Donnellan was interviewed about Dowsing and the Paranormal on Saturday, March 17, 2012 by Chelsea Damali of the U.S. based Shadow Walkers Radio show. Janine’s interview starts at 38:10 and ends at 52:25. 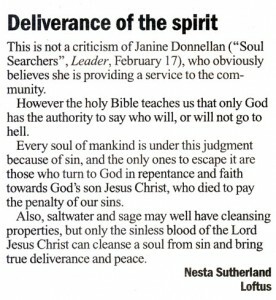 By Belinda Connolly from: St George and Sutherland Shire Leader, Tuesday March 13, 2012, p.17. 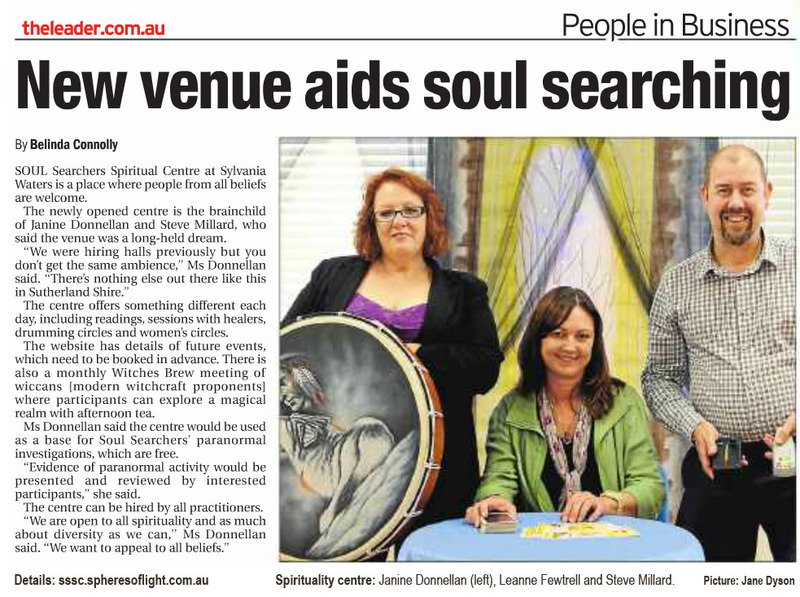 Click here to view the article online at theleader.com.au. 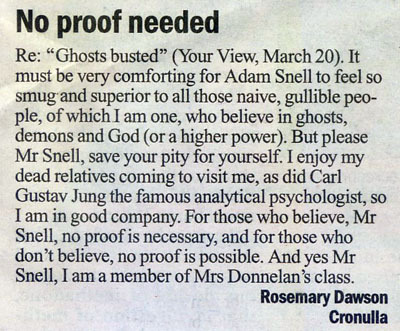 Or, click on the images below to see it as a jpg image copied from the newspaper website (upper), as it appeared in the actual newspaper (middle) and the responses it generated in the “Your View” section (bottom) published 20/3/2012 and 29/3/2012 respectively. By Belinda Connolly from: St George and Sutherland Shire Leader, Thursday February 17, 2011, p.18. By Angela Saurine from: news.com.au on November 01, 2010 11:36AM. Click here to view the article online at news.com.au. Or, click on the image below to see it as a jpg image copied from the website. 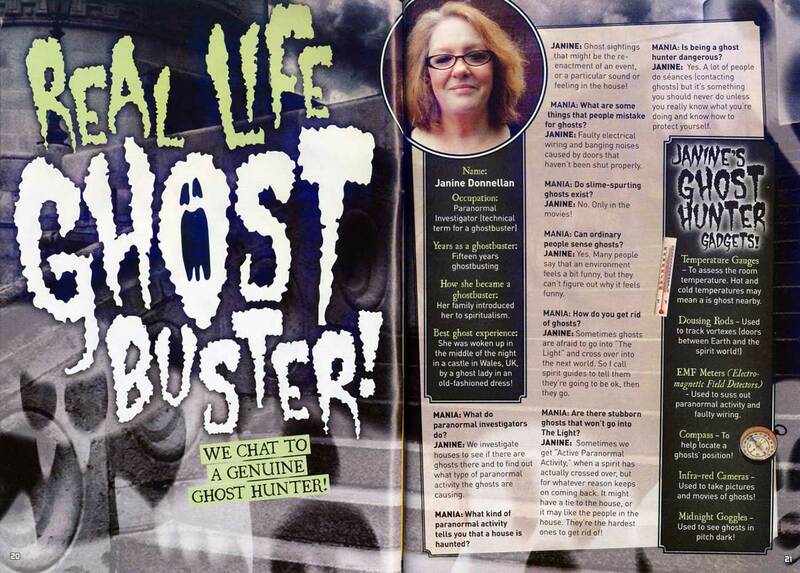 We chat to a genuine ghost hunter! By Janet Fife-Yeomans From: The Daily Telegraph, July 17, 2010. 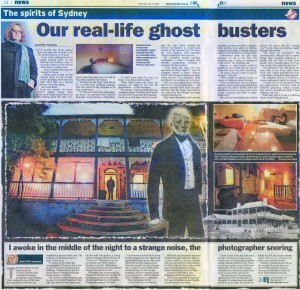 Click here to view the article online at the Daily Telegraph website.